Abrasion or cutting of the gum tissue. Burns of the palate or gum tissue due to hot foods such as pizza,etc. Many people needlessly suffer from canker sores or apthous ulcers. 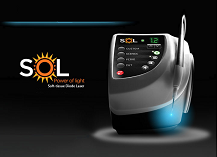 Gentle laser energy is used in our office to quickly heal these painful and sometimes debilitating mouth ulcers. Periodontal disease or gum disease is an infection of bone and supporting structures of your teeth. Before 30 years of age, decay is the major reason for tooth loss and after 30 years of age, gum disease is the major reason for tooth loss. The founders of The Mayo Clinic have declared: "A healthy mouth can add years to your life! "They were referring to a growing body of evidence that has linked serious gum disease, also known as periodontitis, to a number of "systemic diseases that afflict the body. The addition of laser technology in dentistry has allowed Dr. Scianni to perform a variety of soft-tissue (gum) procedures to obtain the best cosmetic results possible. The expanded laser treatment capabilities, makes it easier to provide patients with better, faster and more comfortable care. Sensitive teeth can be caused by many things. Most often this is caused by gum recession. Most of the time people brush too hard or use a hard or medium toothbrush and cause the root surfaces to wear.